Many in New York, Grenada and elsewhere, are deeply saddened by the news of the 28 October passing of Sir Nicholas Brathwaite, former Prime Minister of Grenada, Carriacou and Petite Martinique. It can be said that a great light has gone out in our nation, for he was an amazing man and a towering figure in his community. Sir Nicholas was the epitome of honesty, love and community solidarity. He was also a true statesman. Today is a day to focus on his legacy, on his life, his work, and the inspiration he has given to people across our tri-island state. Just as his father provided guidance to him on the importance of acquiring knowledge and caring for community members, so too Sir Nicholas used a similar approach by grooming the members of his family and the community for excellence in leadership, irrespective of political beliefs. 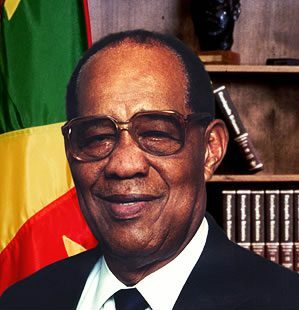 Recognition of his deep insights to life and his mature leadership qualities resulted in his appointment to serve as chairman of the Interim Government of Grenada from 1983–1984, and subsequently in his leadership of the National Democratic Congress NDC party, which was elected into the offices of Government in 1990. As Prime Minister of the tri-island state between 1990 and 1995, he played an important role in securing peace and stability of the tri-island state, strengthening public affairs and economic development. He was highly respected. The passing on of any great leader, is indeed always a great loss to any nation. But we can take solace in the fact that, under his tutelage, younger members in the society have been groomed to build upon his success. On behalf of the members of the NDC New York Chapter, I offer our deepest sympathy and heartfelt condolences to the family of Sir Nicholas, his close friends, well-wishers, and to the Government and people of Grenada, Carriacou and Petite Martinique. May his legacy live on, and may his soul be in eternal peace with God.